It’s worth pointing out, too, something that Larson doesn’t really focus on: within corporations, freedom, even negative freedom, is severely curtailed. In the absence of a union, the employee has hardly any rights. There’s no freedom of expression, for example, and the boss can threaten you, manipulate you however he wants, verbally abuse you, behave horrendously towards you with probably no repercussions for himself. Capitalism, in fact, is a kind of fragmented totalitarianism, as privately totalitarian corporate entities proliferate all over society and constitute its essential infrastructure, its foundation. The more oligopolistic they become, to some degree even fused with the state, the less “fragmented” and more dangerous the totalitarianism is. Eventually the “libertarian” millennium might be achieved in which all countervailing forces, such as unions, are eradicated and the population is left wholly at the mercy of corporations, reveling in its sublime freedom to be totally dominated. 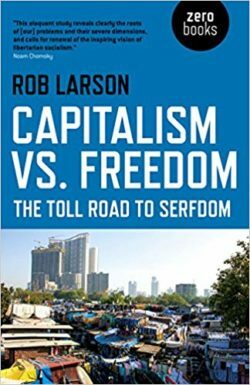 Anyway, to resume the thread: Larson is right that “in portraying [the] concentration of money in society as a reasonable development”—e.g., as a reward for successfully competing against other capitalists—“the libertarian tradition completely dismisses the power of concentrated money.” Hayek, for example, claims that in a “competitive society” (a meaningless abstraction: different kinds of societies can be “competitive”) nobody possesses excessive power. “So long as property is divided among many owners, none of them acting independently has exclusive power to determine the income and position of particular people.” Okay, fine, maybe not exclusive power, but to the degree that property is divided among fewer and fewer owners, these people can achieve overwhelming power to determine the income and position of others. Such as by acquiring greater “positive freedom” to dominate the state in their interests and against the interests of others, who thus proportionately lose positive freedom and possibly (again) even negative freedom; e.g. if the wealthy can get laws passed that restrict dissidents’ right to free speech or free assembly. This article was posted on Wednesday, August 8th, 2018 at 5:42pm and is filed under Book Review, Capitalism, Classism, Socialism.